Would You Take A Jeep Grand Cherokee SRT To The Drag Strip? Hey, it does have Launch Control. We’ll fully admit this wouldn’t be our first choice of vehicles if we were competing in a drag race. If, however, we were just headed to the drag strip for fun, then a Jeep Grand Cherokee SRT would definitely be an interesting, if not entertaining, choice. The crew over at Carfection figured why not when it came to choosing a ride for the drag strip, and on paper the Grand Cherokee SRT ain’t half bad. Launch Control? Check. 6.4-liter Hemi V8? Oh yeah. But even having Launch Control can’t make up for the lack of drag racing experience, as our two wristwatch wearing hosts quickly learns. To better understand and appreciate the skill required for drag racing, a couple of more conventional drag racers are brought in to show how it’s done. But we’d honestly love to see the upcoming Grand Cherokee Trackhawk with its Hellcat V8 have a go at the strip. It would surely put up a better fight than the already formidable SRT. 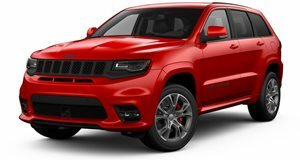 The Jeep Grand Cherokee SRT8 is a high-performance luxury SUV that can be had at a much lower price than all the rest.